Super stretch and texture, with a pattern that may seem intimidating at first (but becomes easier as you go along), makes this stitch very interesting. The texture makes it thick, but the yo's keep it lightweight. The reverse side looks like purling. 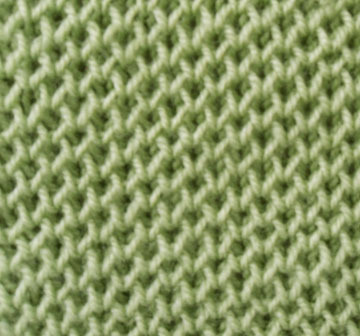 The one drawback to this stitch is "snagability". The thickness makes it undesirable for socks, and the ability to snag easily might make it a poor choice for mitts, or sleeves and lower torso of a sweater. When reading the chart, remember that the grey areas represent the absense of a stitch. They are there to compensate for one stitch that will be used as two stitches in the next row. In most brioche knitting, you knit/purl together a stitch and the yo that was done with it, in the previous row. 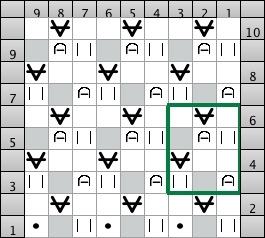 However, in this pattern, the yo is slipped up to the NEXT row (2 rows up from the sl1yo) to be brioched in THAT row. Cast on a multiple of 2 stitches (which will be increased to 3 in row 2 by the yo's, then decreased back to 2 in the following row by the brioche stitch, and continue on in this manner throughout the pattern). 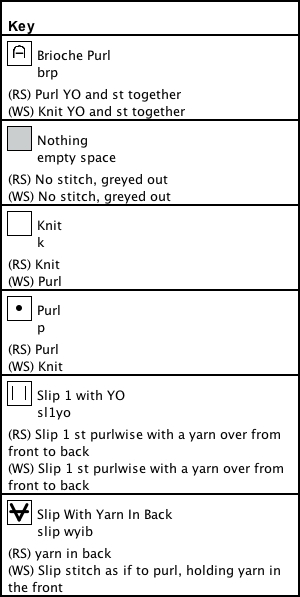 *Note - when handling the "k1, slip wyib the yo stitch", you will knit the stitch that the yo "sits on" first. Then slip the yo stitch wyib. And the same goes when you have k2, before the slipped yo.